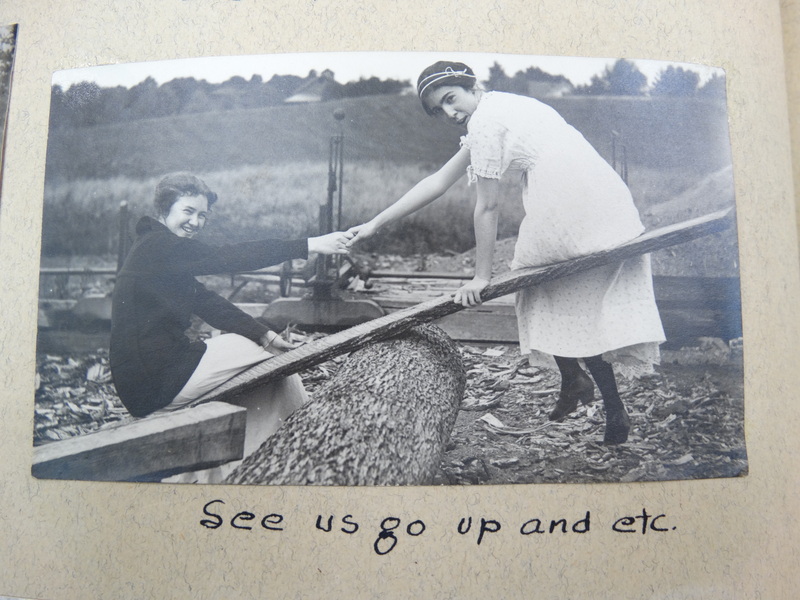 Think about life at MSU in the early 1950s. Is it easy to picture? Unless you are an avid historian it might be harder than you think. 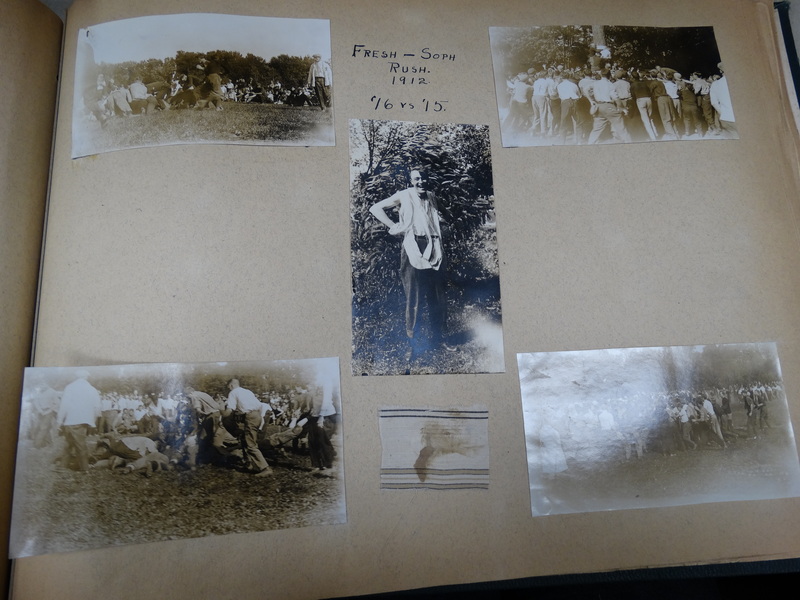 While scrapbooks may not tell us the entire story they certainly give us a wonderful glimpse into the past. Donna Moran was a student at Michigan State College from 1949-1954. She kept a detailed scrapbook of her freshman year as a co-ed at MSC. 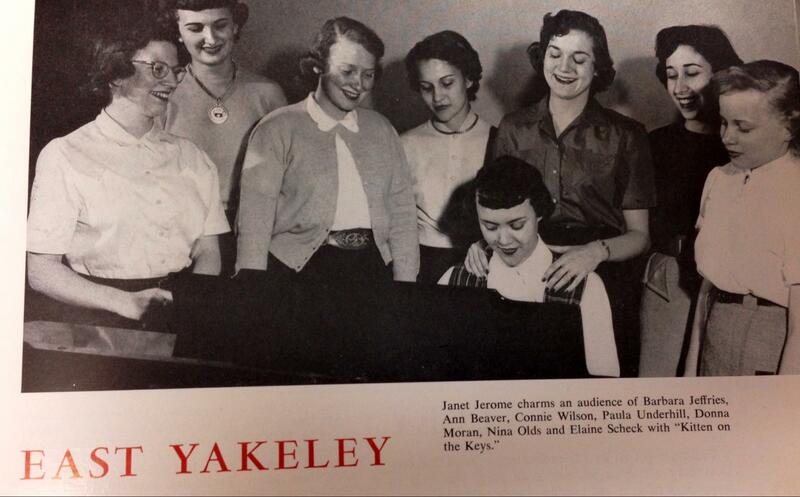 Taken from the 1953 Wolverine yearbook. Donna is pictured with her hands on the pianist. Originally from Detroit, Donna was an avid theater goer and kept many programs from shows she attended on campus. She witnessed the Ballet Russe, University Concert Series and many other shows during her freshman year. Dances were especially popular during her time at MSC. 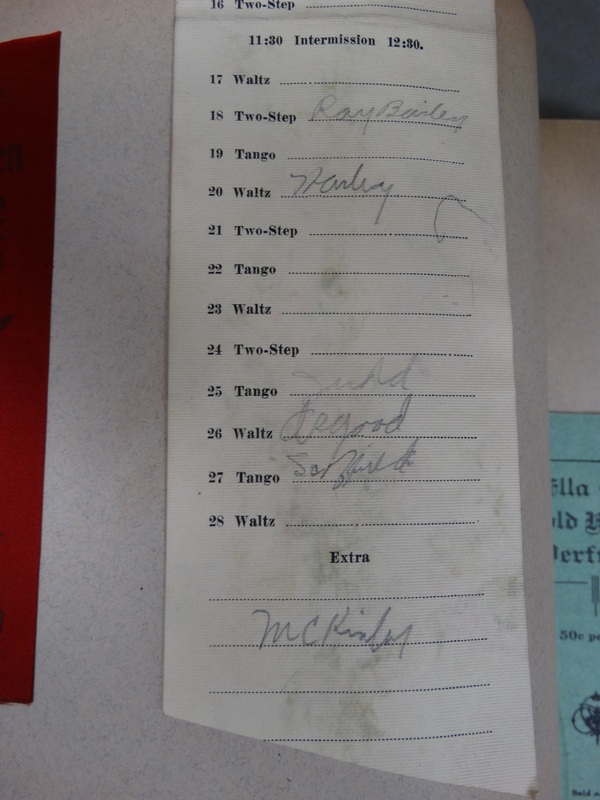 She kept track of many of the dances she attended, who her dates were, and even the names of other couples she attended with. Although Donna lived in the newly completed Elida Yakeley Women’s Dormitory, MSC was struggling to keep up with student housing needs. With too many students and not enough campus dormitories during the post World War II boom, MSC had to install temporary structures to accommodate them. 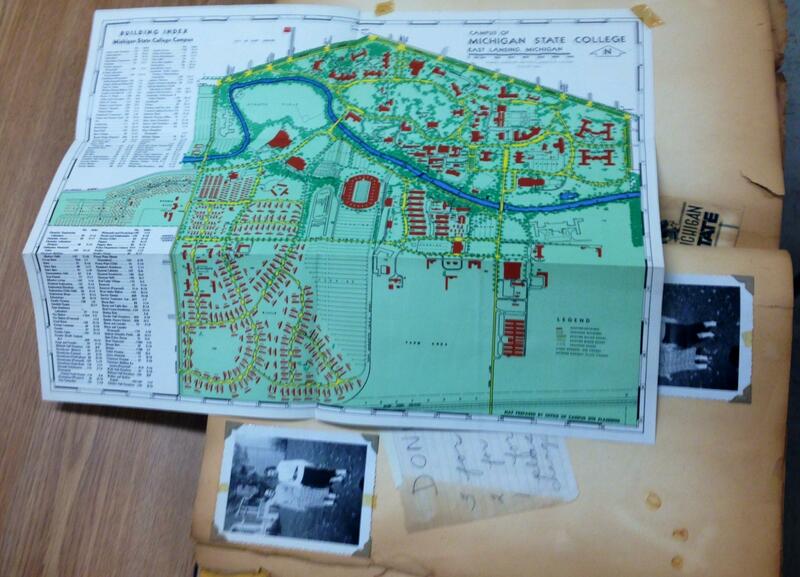 A campus map from 1949, found in Moran’s scrapbook shows the barrack-like Quonset Village in the bottom left hand corner. 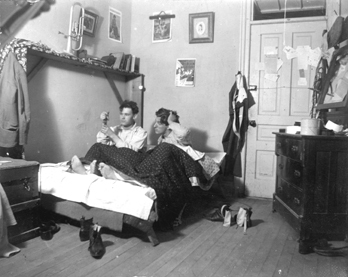 Without the use of cellphones, most dorms and dorm rooms had their own land line phone to be shared. To keep track of who was calling them and for what reason, Moran and her roommates kept a comprehensive record of their messages. Donna preserved this record in her scrapbook. Like many women in the early 1950s, Donna graduated with a degree in Education. 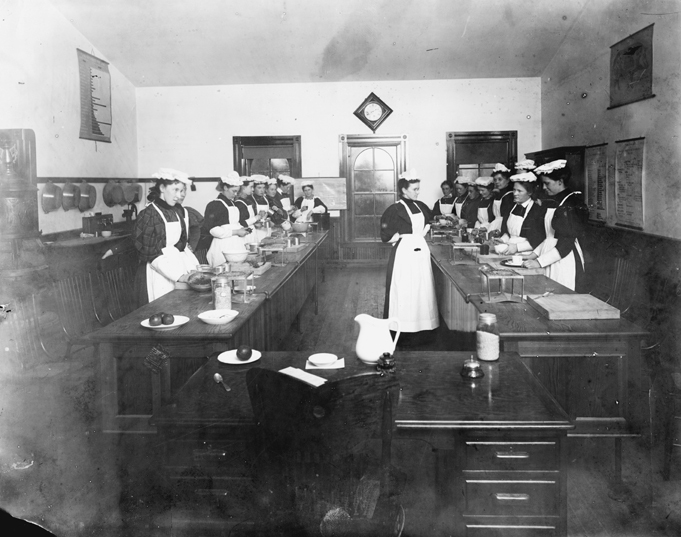 Although there were women enrolled in almost every program at MSC during this period, the two most popular subjects for co-eds were Home Economics and Education. Life at MSU over 60 years ago would have been quite different than it is today. Although many traditions and practices remain the same, clothes, activities, and even communication on campus would be unrecognizable to freshman classes in 2014. 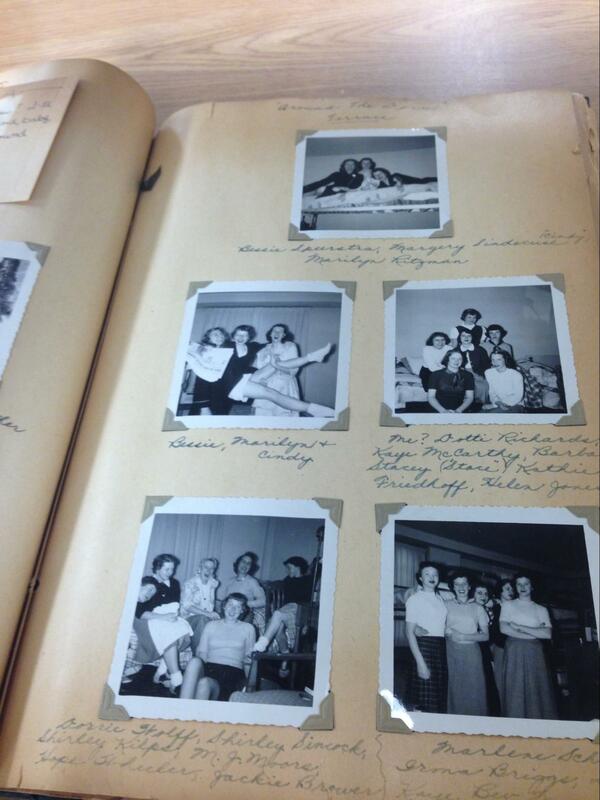 Through Donna Moran’s scrapbook she allows us to take a small peek into her life at MSC in 1949. Moran and her friends share some fun in East Yakeley Hall. In keeping with the theme of women at MSU, I thought it would be important to honor the women for whom the dorms of West Circle are named after. The atmosphere of the West Circle community is beyond compare and the historical feel I get from walking from residence hall to residence hall makes me feel as though I have been transported back in time to the late 1940s when West Circle was the newest area on campus. Six buildings make up the complex, Williams, Yakeley, Gilchrist, Mayo, Campbell, and Landon Halls. Each hall is named after an important woman who contributed to MSU in some way. Built in 1931, Mary Mayo Hall was the first West Circle residence hall. Mary Mayo was born and raised on a farm near Battle Creek, Michigan. After graduating high school she became a district school teacher at age seventeen and married Civil War veteran Perry Mayo at age twenty. Mrs. Mayo would have two children, a daughter and a son. She wished for her daughter to attend a collegiate institution; however she saw a lack of education for her daughter at MAC, because (at the time) a woman’s program did not exist. Mary Mayo became very active in the The Grange. In this organization, women were admitted as equals to men and therefore became a salvation and outlet of companionship for many farm women. Throughout her speeches and lectures with this group, she began to advocate for a creation of a women’s course and the building of a women’s dormitory at MAC. She believed that the current curriculum offered little to farm women and even less to city women. Mrs. Mayo’s persistence in pushing for a woman’s program was heard. In 1896 the women’s course was officially created and the new Women’s Building (Morrill Hall) was originally supposed to be named after her. Sarah Langdon Williams Hall was the second West Circle building to come along. Built in 1937, this dorm was dedicated to the wife of the college’s first president, Joseph Williams. Sarah and her husband were leaders in fighting against oppressed humanity, for the cause of woman suffrage, and for general civic and social reform. She lived in Michigan with her husband while he served as president as MAC, but after his death, she returned to her home city of Toledo, Ohio. While in Toledo, she founded and edited the Ballot Box, the official publication of the woman suffrage movement; she was also involved in the Toledo Woman’s Suffrage Association, the Toledo New Century Club (of which she was a founder), and the Toledo University of Arts and Trades. She was also a well known friend of Susan B. Anthony and Elizabeth Cady Stanton. Mrs. Williams also served on the Civil War battle fields as a nurse and was mother to three children. Campbell Hall was the next dorm to be completed in West Circle. Built in 1937 as well, this building was named after Louise Hathaway Campbell. Mrs. Campbell was a state leader in the Home Economics Extension Service and was appointed to the Dean of Women position in 1923. She came to Michigan after working in Iowa and North Dakota where she earned her Bachelor of Science degree in the State Agricultural College at Fargo. She was an enthusiastic person and an outstanding leader. While serving as the Dean of Women she expanded the Division of Home Economics by creating a faculty of four associate professors, three assistant professors, six instructors, and ten house mothers. She re-organized the curriculum and divided the courses into different groups such as Foods and Nutrition, Institutional Management, Clothing, Textiles and Related Arts, and Vocational. 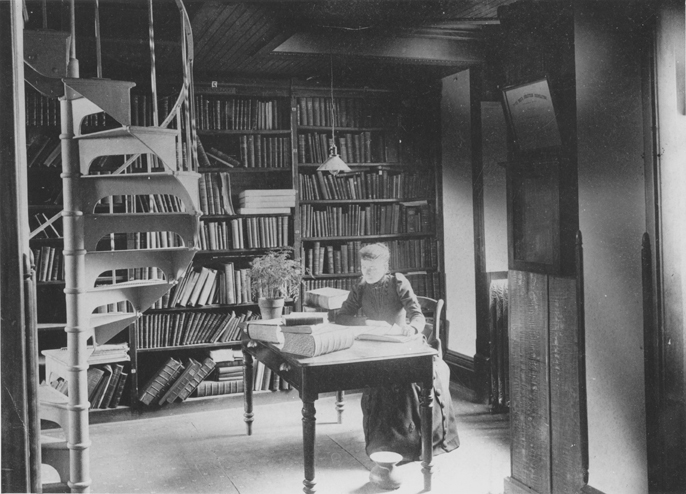 Mrs. Campbell also broadened the division with the establishment of a graduate and research department. 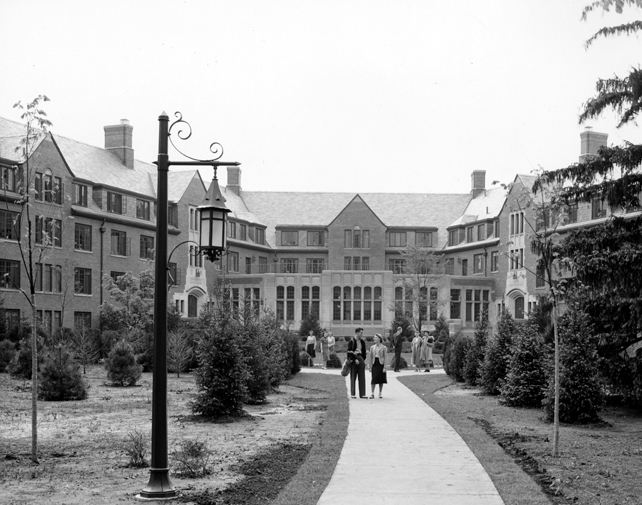 In 1947, Yakeley Hall was built. Named after Elida Yakeley, this hall was, and still remains, a female only dormitory. 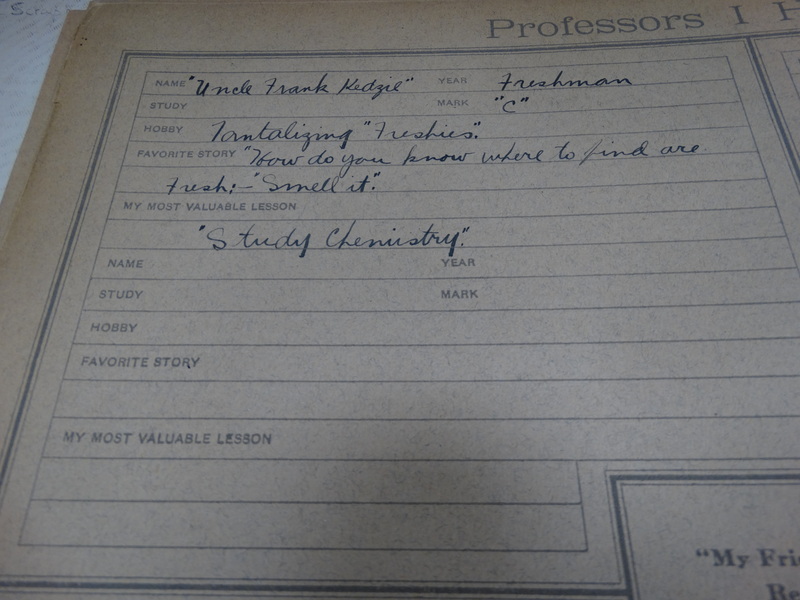 Ms. Yakeley was MSU’s first registrar. She was very personable and easy to talk to. Throughout her thirty years working as a registrar, she personally knew every student that registered within the University – granted, at the time there were only 500 students enrolled. Ms. Yakeley stated that her job was very easy and a painless process (unlike today’s system). 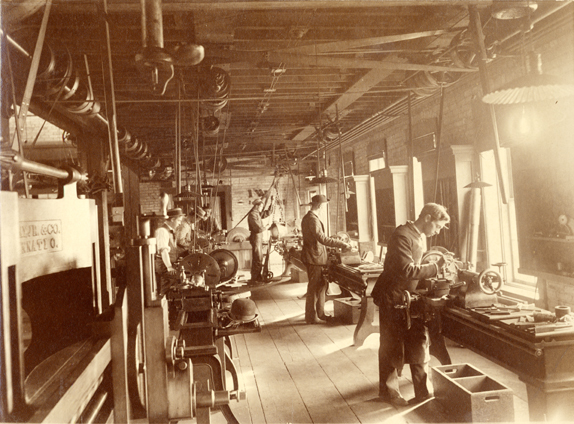 There were only three courses available: agriculture, engineering, and the women’s course. She would also figure out a way to streamline the enrollment process which would prove to help the department for many years to come. Landon has the next building erected in West Circle. Linda Eoline Landon Hall was built in 1948 and named for possibly one of the most influential and well liked women in this history of MSU. 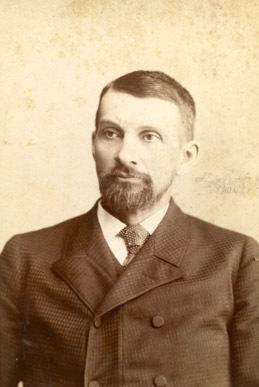 Linda Landon served as the school librarian for 41 years from 1891 to 1932. She loved her job and the students immensely and the school loved her back. She was born in Niles, Michigan in 1886 and would marry Rufus Landon. She graduated valedictorian of her high school class and became an instructor at Kalamazoo public schools. She was originally an English teacher at MAC, making her the first woman instructor on the campus. She eventually became the school librarian and did wonderful things during her tenure. As the librarian, the library doubled in size, quadrupled the amount of books, and the number of students who benefited by her instructions and kind suggestions grew exponentially. Every individual that graduated during the last 30 years of her term would always have a personal reminder of Mrs. Landon in their diploma for it was she who affixed the ribbons to them. The 1912 Wolverine was dedicated in her honor. It stated: “No person at MAC more deserves the honor of the dedication of the year’s Wolverine than does that amiable, pleasant little lady in black who more than anyone else has been tutoring thousands of students in the art of appreciating, loving, and valuing these true friends in life – books”. The other hall built in 1948 was Gilchrist Hall named for Maude Gilchrist. *Maude Gilchrist became the Dean of Women in the summer of 1901. She brought with her a wide educational background and vast teaching experience. She received a Bachelor’s of Science from Iowa State Teachers College; spent three years at Wellesley College, where she tutored freshmen in mathematics; spent a year in Germany at the University of Goettingen; and received a M.A. from the University of Michigan. She also spent a summer at Iowa Agricultural College studying prairie plants under Dr. Charles Bessey; a summer at the Woods Hole Marine Biology Laboratory; and took two winter courses in economic botany at Harvard University under Dr. George Goodale. Prior to MAC, she spent three years as an instructor at Iowa State Teachers College, ten years teaching botany at Wellesley, and four years as Dean at the Illinois Women’s College. She taught ethics and the history of education, as well as the occasional section on botany, when needed. During her 12 years at MAC, enrollment in the Women’s Course increased more than 125 per cent and the curriculum was advanced to a higher level. I am very proud to be a resident of West Circle. The residence halls were named after great women who contributed a lot to MSU and the buildings will forever stand as a reminder of their great achievements! 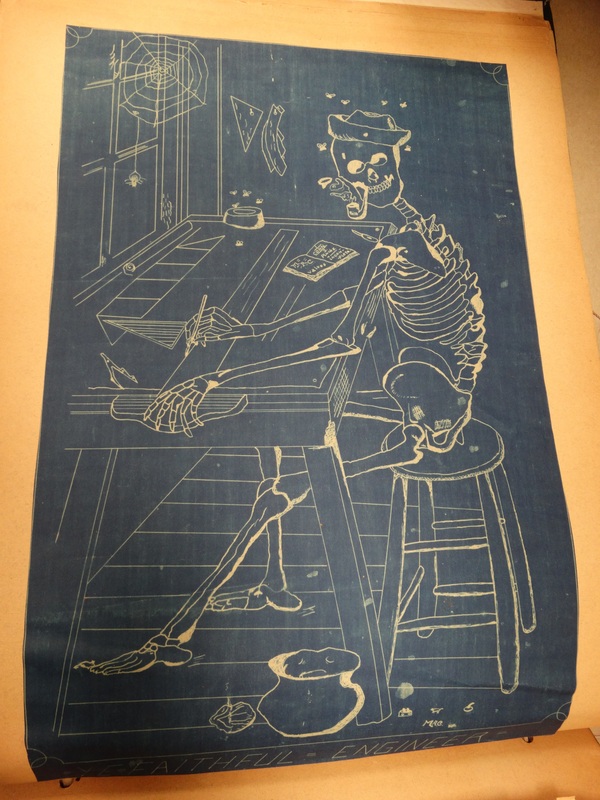 As archivists we get to see a lot of different materials in our collections and we certainly have our favorites. Recently I discovered a photograph that I’m sure I had seen before, but never really paid much attention to it. Once I looked at the photo, I couldn’t believe what I was seeing. 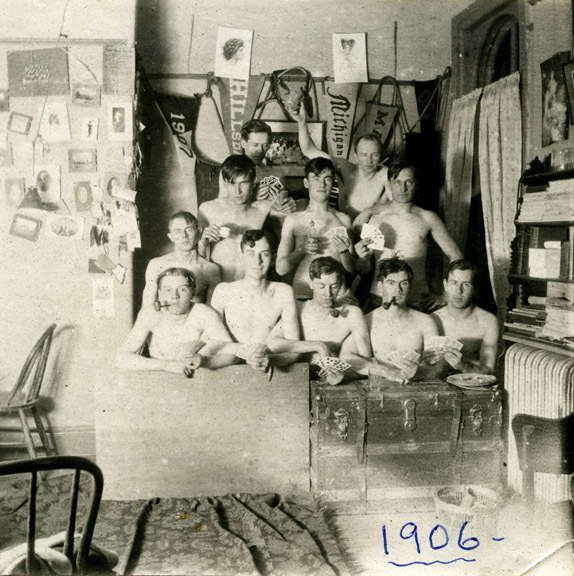 The photo shows a group of (mostly) naked, drunk students in their dorm room. They also appear to be smoking, drinking, and gambling in the photo. 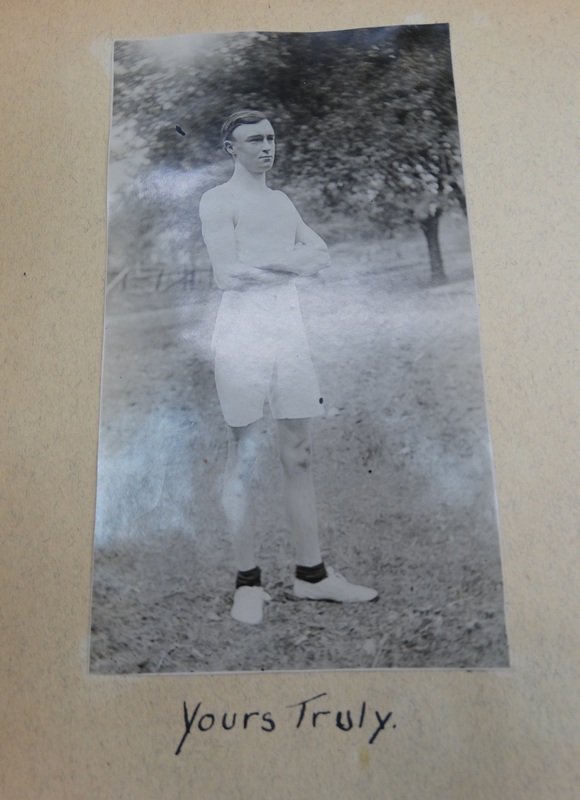 The photograph is dated 1906. 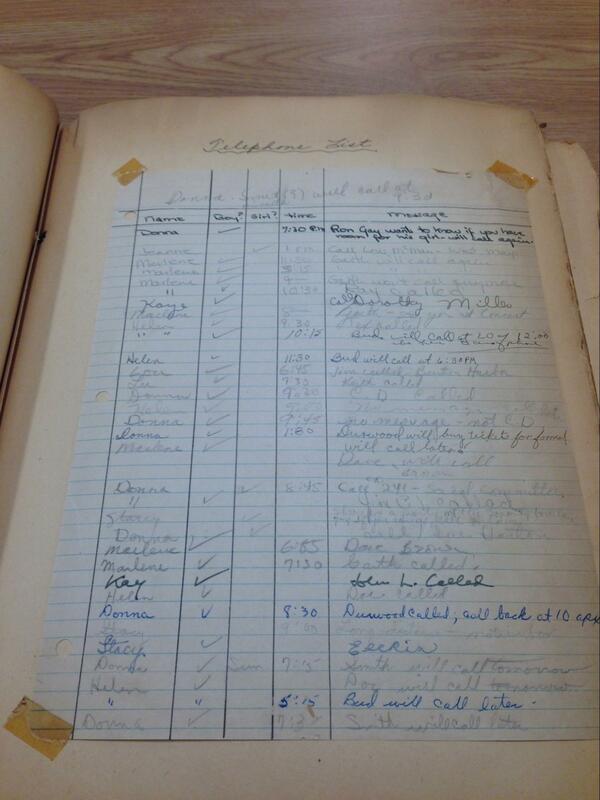 Needless to say, it was against regulations for students to be smoking, drinking or gambling on campus at that time. What I love about the photo is that the students seemed so confident in their behavior that they actually posed for it. It is also a great example of how the administration of a school can set up rules, but that doesn’t necessarily mean that the students were following them. 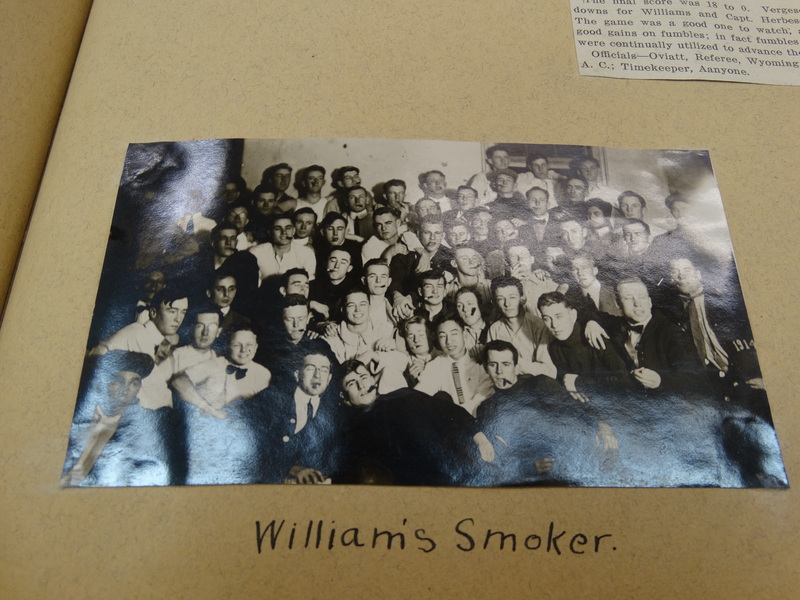 Drunk, naked, smoking, gambling MAC students in 1906.
was particularly bad. The freshman was grabbed by several upperclassmen, had broken eggs rubbed into his scalp, then had his hair chopped off. They tied a sack over his head and held him in the river until he was able to swim away. 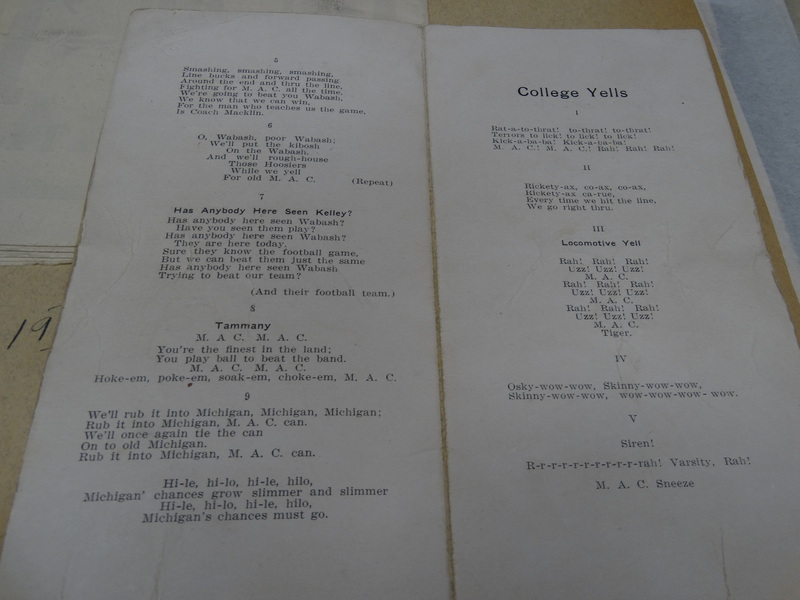 It’s no wonder that hazing was banned on the Michigan Agricultural College campus in 1908. A lot of pranks evolved around the dormitories. Students would jam doors imprisoning their classmates in rooms. Another frequent joke was to dump water out of the window onto the head of a passerby. The ash pail was thrown down the stairs in another prank. Probably the most common prank played in the dorms was to stack the furniture. All the furniture and belongings in a room were piled up in a corner and the room was essentially trashed. The dormitories had such a bad reputation that there was actually a recommendation at one point in time to close them down and have all students live off campus. Shirt Parade. They would dress up in their pajamas and serenade the faculty members who lived in Faculty Row. This was considered a benign prank and usually played on faculty who were friendly with the students. However, students did play pranks on faculty they did not like. 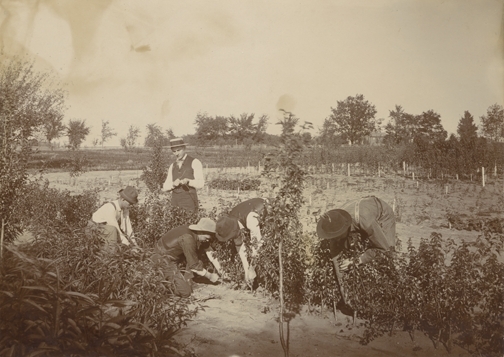 In the 1880s, students were not happy with the way Professor Samuel Johnson conducted his practical agriculture classes. To express their displeasure, students stacked the furniture in Johnson’s classroom, they locked the door and sealed the keyhole with plaster of Paris, and they tied a Shropshire lamb to his podium. Johnson did eventually leave MAC, but it was infighting amongst the faculty that led to his leaving, not the pranks of the students. What do you think of these early campus pranks? Are you surprised the early students were so rowdy?